Is the new Homefront necessary? Pardon that imprudent question, but when a man is drowning in a sea of first-person shooters, may he question the next bucket? This morning we got the non-surprise news that THQ will bring us a Homefront 2 coupled with the surprise news that the game will be made by Crytek, people who have made first-person shooters that people love. There is a chance that this could turn out really well, if a few key things happen. And there's also one big problem that could render the project a big waste of time. A year ago, the whole Homefront effort felt impressively bold. THQ was trying, as most game companies do, to have their own Call of Duty. But they were simultaneously doing something that felt fresh and edgy. That's how it seemed when Homefront was all tease and promise. It would be a shooter set in an America over-run by the invading force of a unified Korea. Players would fight through internment camps of Americans, liberate the parking lots of hardware stores and save at least part of the nation from invaders. The game hobbled to its release, disappointing people who played it with its short and constricted storyline campaign. Its competitive multiplayer that, like most competitive multiplayer modes in most modern first-person-shooters could barely draw a small crowd. Too many potential Homefront customers were busy playing their 1000th match of Call of Duty, which is the self-defeating reason competing shooters like Homefront both exist and fail to catch on. Today, THQ says Homefront was "commercially successful," and, hence we're getting a sequel. THe game wasn't successful enough to keep the studio that made it, Kaos, from being shut down in expensive New York City. The sequel was initially out-sourced to the tax-subsidized game-making mecca of Montreal, but now the future of Homefront will be taken even further from the country it portrays, to Crytek, a company that makes most of its games in Europe. How does this path lead to an FPS sequel that we've got to play? Crytek can fix a big Homefront problem. The best games that Crytek is known for, Far Cry and Crysis were beloved for their beautiful graphics and for their un-funnelled action. These games knocked the walls out of the standard corridors of the first-person shooter and broke down the invisible barriers that constrained much of the action in Call of Duty and other modern gun games. In Crytek's best games, players could more freely go where they wanted to, experimenting with tactics by approaching a combat zone from various angles, testing an array of weapons and exploring what worked best in a specific skirmish. The point of Crytek's open approach to first-person shooter level design is to give players the freedom of a guerilla fighter, to let them get out of the marching lane of most FPSes and into the jungle sidelines of an insurgent combatant. The Homefront fiction calls for players to fight as a guerilla force, to sabotage and antagonize an occupier. That should suit the makers of Far Cry and Crysis perfectly. If one of the problems with Homefront is that it felt to narrow and too linear, THQ couldn't do better than Crytek to open things up. Of course, graphics probably sell more than open-FPS-gameplay does and it is Crytek's formidable graphics tech that likely helped THQ sign Crytek for the sequel. But look at what Homefront is—or at least what I think it is: it's a game about America. America, as people who've traveled through it know, is big. It's defined by its expansiveness, its cities' broad streets, its vast plains, great lakes, its super-sized landscape. It doesn't seem right that a game about America would feel as constricted as the first Homefront did. If Crytek opens things up as only Crytek can, that would feel right. …to the more global description of the Homefront franchise in today's Crytek press release…. Are we simply in store for another multi-theater globe-trotting first-person shooter in Homefront 2? Been (Modern Warfare) there repeatedly, already about to (Battlefield 3) do that again. Crytek could use a dose of Homefront. When many of us last had a chance to play a new Crytek game, we were playing Crysis 2, a game that, like Homefront was supposed to grab the FPS player during the Call of Duty off-season. It was a game that, like Homefront was set in an invaded America. Crysis 2's invaders were aliens who resisted the player in a partially-toppled New York. That scenario signaled Crytek's desire to tap gamers' zeal to defend an iconic American metropolis. It didn't, however, distinguish its enemies or its take on America in the process. These alien invasions and detonations of America blur into one. We're at the precipice of subjectivity here, but a resistance against Korean occupiers in the American west feels fresher and more distinct than the repelling of another alien invasion of New York. Homefront's fiction therefore doesn't just suit the style of game Crytek excels in, but also could help make Crytek's new game feel more relevant and more special. None of this matters without genius multiplayer. Modern first-person shooters don't sell millions because of their storyline campaigns. They don't stay in people's game consoles eight months after they were bought because people want to relive the narrative again. Multiplayer is the draw. Multiplayer is the past-time. 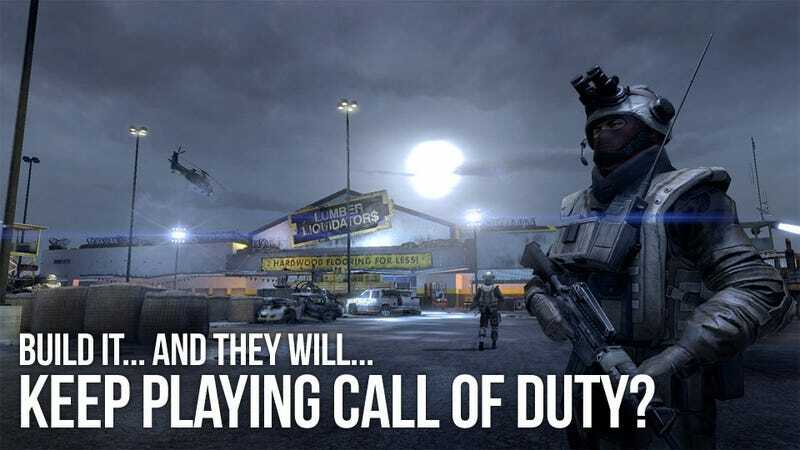 Multiplayer is what no Call of Duty competitor has been able to make much of a dent in. Battlefield 3 will try next month, but already this year, Homefront failed, Crysis 2 failed, F.E.A.R. 3 failed, Killzone 3 failed, Duke Nukem Forever failed and so on. CoD is still king. Halo still hangs around, too. This is where the "why bother" question seems Quixotic to answer. To get Homefront 2 to be a hit, Crytek needs to figure out how to do multiplayer that matters and, well, uh….that's like asking someone to make a subscription MMO that can knock off World of Warcraft. Surely someone is going to do it some day? The people who brought us Crysis could give us a terrific Homefront 2, one that could have an excellent and interesting big-sky-America adventure. There's just that multiplayer question…. Good luck, Crytek! Maybe make it free-to-play?